New Tampa, Florida is a region in the Tampa Bay area north of downtown Tampa and north of the main University of South Florida campus. The area includes the Tampa Palms, Pebble Creek and Hunters Green golf course communities and easy access to both I-75 and I-275. As the name suggests, New Tampa has experienced a lot of development quite recently. The population nearly quadrupled between 1990 and 2000 and several new neighborhoods are being planned for the future. If you are building a home in New Tampa or recently purchased a home without a pool and would like to build one, Grand Vista Pools can turn your back yard into the perfect New Tampa outdoor living space for you, your family and friends. We've been building new swimming pools in Tampa, Florida for decades. What makes Grand Vista Pools unique is we are both an experienced pool builder and a licensed general contractor. This means we can design and build your entire outdoor living space including any renovations to your home to help your indoor living space flow to your outdoor living space. Hiring one company to be both your general contractor and pool contractor will simplify your life and prevent confusion and scheduling issues. While New Tampa is... well, new, some of the homes and pools in the area are 20+ years old and in need of repair or remodeling. We can do everything from basic pool resurfacing to an extreme makeover. Want to add a spa? Lighting, water or fire features? 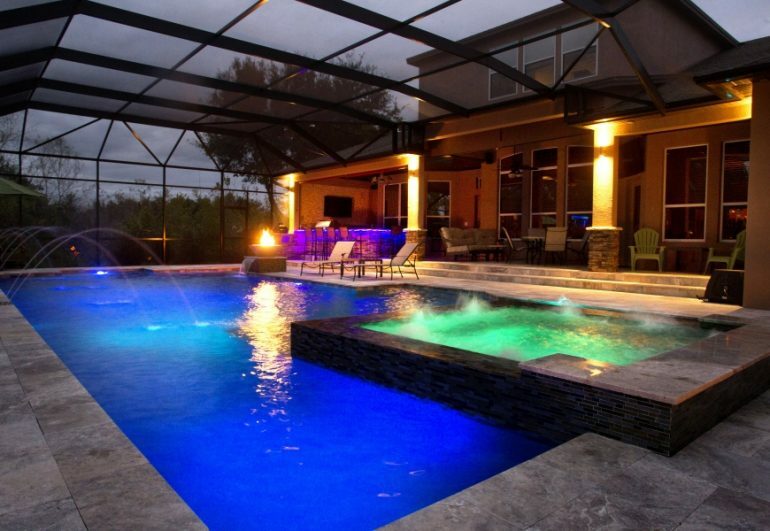 Those are the kinds of New Tampa pool remodeling projects we specialize in. Grand Vista Pools also specializes in creating and building New Tampa outdoor kitchens. Food is a feature of nearly every gathering with family and friends. If you want to make the most of your time in your outdoor living space, bringing the cooking outside can help do that. Whether you're looking for an outdoor grill, an outdoor kitchen, an outdoor bar or some combination of the three, we can design and build it for you.